KANSAS CITY, Kan. — The clock strikes 6 p.m. in Texas. Outside a state prison, chilling cries can be heard. Another execution has taken place. “I cannot tell you the sounds that I heard,” said Scott Langley, recalling the moment he stood with a crowd while a prisoner was executed inside a building just hundreds of feet away. “The cries coming from his mother at the moment her son was being killed,” he continued. A photojournalist and death penalty activist, Langley spoke at Donnelly College in Kansas City, Kansas, on March 23. 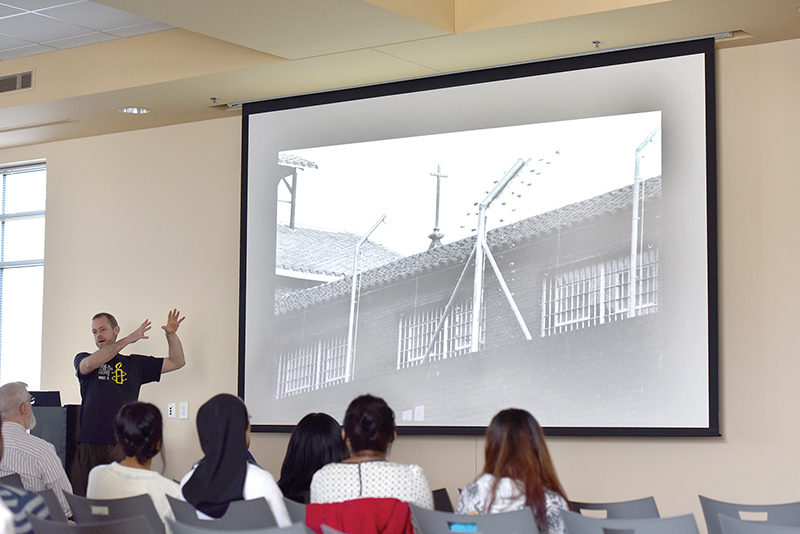 His presentation, along with a two-week exhibit of his photographs that document what goes on in and around execution facilities before and during an execution, were part of a semester- long effort by the college to discuss the issue in depth. The school has also utilized “Dead Man Walking” by Sister Helen Prejean, CSJ — a book about her work as a spiritual adviser to two convicted murderers on death row — in this effort. But perhaps the most eye-opening part of the semester has been Langley’s presentation. Paired with haunting photographs in and around execution facilities around the time executions occur, Langley told the story of what happens leading up to and during the moment of death for prisoners on death row. Langley first became interested in the death penalty during his senior year of college at Southern Methodist University in Dallas. The years during Langley’s time in college featured the peak years of executions in the United States. “We had almost two executions a week happening in this country,” he said. As part of a class project, Langley chose to document what happened outside facilities where executions were taking place. “All of a sudden, it became a very raw, concrete experience where I knew that I could pinpoint the exact time, the exact place and the exact manner in which someone was about to die,” he said. Since then, Langley has traveled the country, both as a photojournalist and an activist against the death penalty. The most shocking experience he had was a case in which the parents of the prisoner being executed stood with the crowd outside the facility. “The image of that mother crying is seared into my brain,” said Langley. The death penalty, he said, affects countless people we don’t even think of. “Every prisoner executed is leaving behind a mother, a father, a sibling, uncles, aunts, grandparents — a community that loves and supports them,” he said. The lengthy process of death row, Langley argued, also affects the family of the victims, as it drags on over the years and is a continual reminder of their loss. The entire process can make it even harder for them to move on. And Langley’s passion against the death penalty isn’t driven by compassion for any particular prisoner, he said. Langley went on to present a series of photographs he took both inside a death row execution facility prior to an execution and outside the facility in the moments leading up to the execution. Msgr. Stuart Swetland, president of Donnelly College, concluded Langley’s presentation with his own. That makes each of us responsible, he said. Msgr. Swetland testified to the Kansas House of Representatives on Feb. 13 in favor of House Bill 2167. The bill would abolish the death penalty in Kansas. “It is always difficult to speak about the death penalty,” he said in his testimony. “The crimes that lead to a sentence of death are almost always vicious, heinous and heartbreaking,” he said. “Opposition to the death penalty in no way lessens one’s awareness of the evil that some are capable of committing. Msgr. Swetland went on to argue why the death penalty is wrong and offer his hopes that it will be abolished in Kansas. “Now is the time for all in Kansas to show our strength of character, our virtue and values, and to affirm a culture of life by finally rejecting recourse to the use of the death penalty in our great state,” he concluded. To view Langley’s photos and for more information on his work, visit the website at: www.deathpenaltyphoto.org.